It's been an amazing last four weeks. 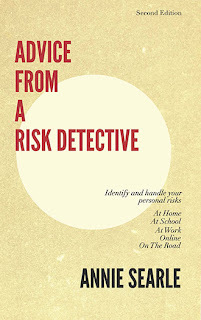 In late May, we published the second edition of Advice From A Risk Detective, with a whole new section on identifying risks from the moment you turn your child over to a caregiver, through the college years. We'll be contacting area schools to see if we can set up speaking engagements about risks in general, but for teens in particular. And we'll launch an overall marketing campaign for the book starting next week. I'm quite proud of the book -- it's hard to write something that everyone can read and understand, using stories wherever possible to illustrate the point(s). On the publishing front, Emily Oxenford has agreed to take the weight of the second volume of Reflections on Risk, which will contain 27 new research notes. She'll edit the notes, write the head notes for each, and a general introduction to the volume. It's a pleasure to have a former ASA research associate take on this role in her spare time, especially since it leaves me clear to work on new projects. View down into Washington Square from the NYU Global Risk Forum. I've been doing more public speaking of late. In early June, I was invited back to the Global RIsk Forum, one of roughly 50 thought leaders around the big table in a room with a view. Cyber-threats and terrorism still hold the top two places on nearly everyone's risk radar. We had special presentations from DHS on infrastructure, from a McGill University expert on hactivism, and a CDC presentation on emerging threats from influenza strains like the Saudi novovirus. On the second day of the forum, the Port Authority of New York and New Jersey offered us a tour of the 911 Memorial Museum (still a work in progress) and One World Trade Center, otherwise known as Freedom Tower. We are all in hard hats and vests because this is an active construction site. This is one view of the exterior of the 911 Memorial Museum. The museum actually descends into the ground, where most of it will be housed. Here we are down one floor from the lobby which is not far from the memorial fountains. One of the beams that remained standing on site after 9/11. It will be displayed in the museum. People you can see through the window are at the fountains in the memorial park. Two rough elevators to get to 90th floor. Here we are standing on external platform, watching workers on the 91st floor. The view is extraordinary from the 90th floor is top floor of offices. The observation deck will be higher up. We were allowed to leave our names on one of the interior walls on the 90th floor. We felt extremely privileged to have been part of the tour of what is actually a 16 acre campus, where PATH and the subways will have a central hub underground in what will surely be one of the most beautiful buildings on the campus. On our way down after the tour. I flew back in time for the last class of the quarter, where the students presented high level summaries of their long papers. It was quite magical, made more so by the fact that my husband catered the event. Afterward, I reviewed 80+ Capstone presentations in another building, which gave me a chance to congratulate some 30 or so other graduating MSIM students that I have taught or mentored. I'm preparing now for three more speaking gigs over the summer. Late this month, I'm speaking on reducing the risk of cyber-fraud to the Washington Society of CPAs. In late July, I chair the last session of the Public Private Partnerships conference, sponsored by DHS and FEMA, in Washington DC. It's called "Extending Our Reach," and will look at ways to revitalize and enhance such partnerships in a targeted fashion. In August, I speak in Phoenix at the Institute for Internal Auditors conference on Governance, Risk and Compliance. In between, I'll be finishing up specific pieces of work and starting my next book, a risk guide for executives. Sun Tzu would be proud of me.